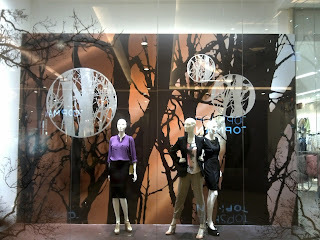 Big trees with no leaves, since it is fall season, are the main attraction of the Marks and Spencer window display. They appear in the black color silhouette with brown sky behind them. To add the darker mood, stickers of smaller twigs are scattered in the glass window, make the display look almost natural. However, there are some strange decorations in the form of giant twig centered medallions hung above the mannequins.